The City of Toronto’s Executive Committee will have as the first item on its agenda, October 20, 2015, an update on studies of Mayor Tory’s SmartTrack scheme. There is a lot of material in this update organized in a main report and several appendixes (linked below). When SmartTrack surfaced as a major plank in Tory’s election campaign, it consisted of little more than a few background reports and a host of assumptions that could charitably be described as “amateur”. After spending five decades in the company of railfans who love to draw fantasy maps and rhapsodize about the old days, I can say that politicians and their supporters have the “let’s draw a map” bug on a scale the fans can only dream of. SmartTrack has the momentum of a political machine, but is riddled with problems, not the least of which is a willful blindness to the plan’s shortcomings. In a separate article, I will turn to a pop-up website that purports to be from an independent group promoting SmartTrack although its members have close connections to the Mayor. In a previous article, I reported on a presentation by Deputy City Manager John Livey at the TTC giving an overview of the state of various transit studies, including SmartTrack. The report to Executive is a much more extensive treatment of the project. It fills in some technical details, but leaves many, many questions still to be answered. SmartTrack boosters take the release of these interim studies as a good sign, although Mayor Tory has already made a claim about SmartTrack’s ability to relieve subway congestion that is not in the report because the demand studies have not yet been completed and published. Either he has an advance copy of those studies (in which case why don’t we see them too), or he is blowing smoke about his pet project. As proposed in Tory’s campaign, SmartTrack would run from Unionville to the Airport Corporate Centre (the solid black route in the map above). Of this, the Eglinton West leg is the most problematic, and recent work has focused at Council’s direction on alternative routes entering the airport lands from the north (dotted line above). A major problem for SmartTrack is that it shares corridors with GO Transit, and more importantly with GO’s proposes Regional Express Rail network that will feature much more frequent service than GO has provided historically. In effect, two competing schemes to improve regional transportation surfaced at roughly the same time, and each has its political support base. The difference for SmartTrack is that it is supposed to be a more local service with frequent stops and TTC fares, but that is easier said than done. 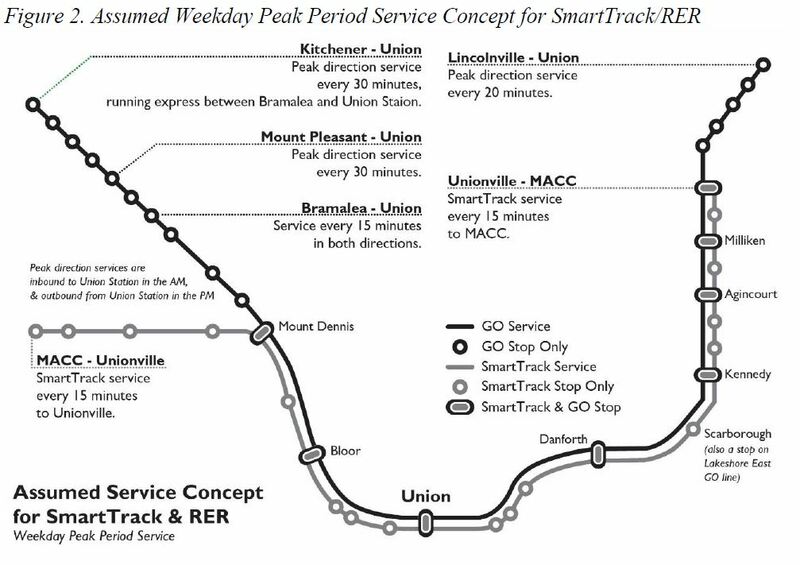 A fundamental question about SmartTrack is the matter of service levels. This has been described as a “surface subway”, but Torontonians are used to the idea that a “subway” shows up at least every five minutes, and this level of service was certainly implied throughout the election campaign. This has now been tempered to a 15 minute frequency of SmartTrack trains mixed in with the RER service. In the diagrams below, the RER service levels are taken from current Metrolinx plans. These maps show what is being modelled in the demand study. This service design gives an RER or ST train every 7’30”, a considerably more aggressive level than Metrolinx discussed in June 2015. At that time, they confirmed that their planned infrastructure for the corridor would only support a 15′ headway of combined services. More trains require a more advanced signal system, not to mention more track, something that is becoming clear in the technical studies. A further problem is that much of this route is shared with other services such as the Lake Shore GO/RER trains, the UPX shuttle and VIA, not to mention the ever-present scheme to operate High Speed Rail from Toronto to London via the “north” route which leaves Toronto via the Weston corridor. It is easy to draw yet more lines on a map saying “the corridor is there”, but much harder to fit all of those services together in the same space. Of course, “regional” or “commuter” or “overground” railways can run at subway-like frequencies. After all, the technologies of a subway train and a electric multiple unit (EMU) GO train differ mainly in design speed and crash strength, but the rest is cosmetic. The issue here is not to say that frequent service is impossible, but that the current Metrolinx plan for corridor infrastructure is nowhere near that aggressive because this would greatly exceed their own perceived needs. Moreover, there are constraints related to continued operation by freight railways over some GO lines. There is a big difference between “every 15 minutes” and “better than 15-minute” service especially in the implications for infrastructure design. If the target is 15+15 (a combined service of 7’30” on RER and ST), this produces very different infrastructure than 15+10 or even 15+6. Very frequent services (6′ headway or 10 trains/hour) cannot easily share infrastructure without careful design to minimize points of conflict and an operating strategy to eliminate delays at these points. The technical studies on infrastructure requirements are not out yet, but an essential point within them will be the target frequency for service. This includes not just isolated segments such as the Stouffville corridor, but also the shared trackage on the Lake Shore, Union Station and Weston corridors. There appears to be some confusion about the exact nature of the target service design even though this will have a very large effect on the infrastructure needs. In turn, service frequency directly translates to capacity and attractiveness to potential riders. Four trains per hour carry a lot fewer riders than twelve, and the transfer between feeder services and the trunk line is relatively more of a time burden. Claims made during the Tory campaign for very high SmartTrack ridership presumed very frequent service, but that is not what’s on the table. A further problem lies in the confusion between SmartTrack and RER. At times, they are presented as an integrated service, but at other times they are quite separate. RER and its infrastructure are definitely a base on which ST can build, but RER infrastructure is not, by itself, enough to permit ST operations even at a 15+15 level of service, let alone SmartTrack at 5 minute headways, the lower bound now under study. Claims by SmartTrack advocates that ST doesn’t need much new infrastructure because it will run on existing GO tracks are, to be kind, misleading. An actual service plan and infrastructure proposal will not come forward until the first quarter of 2016. Another major issue that has been completely ignored by SmartTrack advocates is that two major employment and development centres to be served by this line lie outside of the City of Toronto: the Mississauga Airport Corporate Centre and developments in and near Unionville. There has been no suggestion to date that the 905 regions who would benefit from this line actually pay toward the cost of its implementation or operation. Certainly, they will make an indirect contribution through provincial taxes to the base RER system, but the added upgrades needed to support ST are another matter. By contrast, the subway extension to Vaughan has York Region money in its capital budget, and the proposed extension to Richmond Hill has been discussed on a similar basis. Table 4 in the main report is vital reading as it shows the magnitude of work still to be done for combined RER and SmartTrack planning. The list is long [pp 28-30] and the issues it raises are not trivial. Clearly, even the early 2016 update will not be able to address all of these topics in detail, but at some point, the largest, reddest flags have to pop up to avoid unsolvable problems further into the project. In particular, infrastructure, operational and cost considerations of very frequent service must be understood so that we don’t commit to a capability we cannot deliver. For the balance of this article, I will work through the report’s appendices which each address different aspects of the project. For the benefit of those who have not been following the GO/RER plans, this appendix provides a consolidated view of current intentions. Notably there will be large service increases in peak and especially off-peak operations, and these will trigger the need for major shifts in infrastructure including electrification of much of the GO network. The portions of the GO network that will receive “RER” service are almost entirely those completely under GO’s control and ownership. When this service is in place, the network will be transformed from one whose primary mission is to deliver commuters to King and Bay to one that is truly “regional” and provides good bi-directional, all-day service. A big challenge for GO will remain that the network, based on existing rail corridors, is radial, and there will remain demands for trips that do not lie along the spokes radiating from Union. BRT routes can help, but at some point, the debate over allocation of road space will move from downtown Toronto out into the suburbs. Electrification is essential to GO’s plans because it will allow trains to operate with better acceleration profiles needed both for closely spaced stations and frequent service. 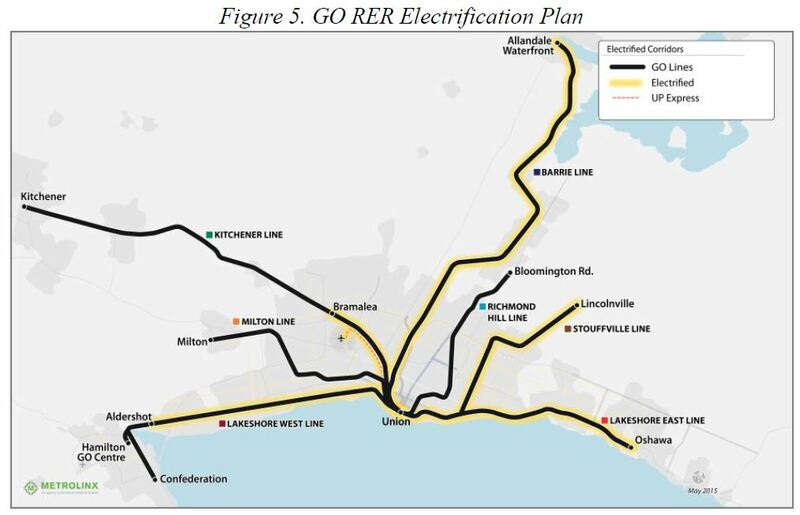 As with the RER service plan, the electrification is limited to corridors that GO controls, with the exception of the Richmond Hill line (owned by the Province from Union north to the crossing with the CN York Subdivision north of Steeles). The Metrolinx/GO RER program represents a substantial capital investment ($13.5-billion 2014$) and an implied commitment to future operating subsidies. When SmartTrack was announced, the position taken by Queen’s Park was that the provincial “1/3 share” would consist of its investment in RER as the base system. The actual dollar value attributable to SmartTrack is unclear, but it is fairly evident that there will be no additional provincial funding for SmartTrack beyond the GO/RER commitments. GO draws its ridership primarily from outside of Toronto with only 12% of the total 197k daily trips being within the city. This is partly a function of the competing TTC system, the service levels at and locations of GO stations, and the fare structure which discriminates strongly against short-haul riding, particularly when the added cost of a TTC fare just to access a GO service is considered. As yet unknown is the degree to which, if at all, there will be a joint GO-TTC fare as part of “regional integration” that will make the GO network more attractive for inside-Toronto travel. This will be complicated by the presence of a “TTC fare” SmartTrack service on two of the corridors while riders on other parts of the “GO” network pay GO-level fares. The infrastructure for RER is already in place in the Weston (Kitchener) corridor, but much work remains on the Stouffville corridor including double tracking, improved stations and grade separations. SmartTrack improvements would be required over and above work already planned by GO. Metrolinx is currently undertaking a comprehensive study of Union Station to ensure that sufficient capacity exists on the tracks, on the platforms, and also on the approach tracks throughout the Union Station Rail Corridor, to accommodate the planned GO RER service levels to 2031. Adding service beyond what is already planned for GO RER will be challenging within Union Station. 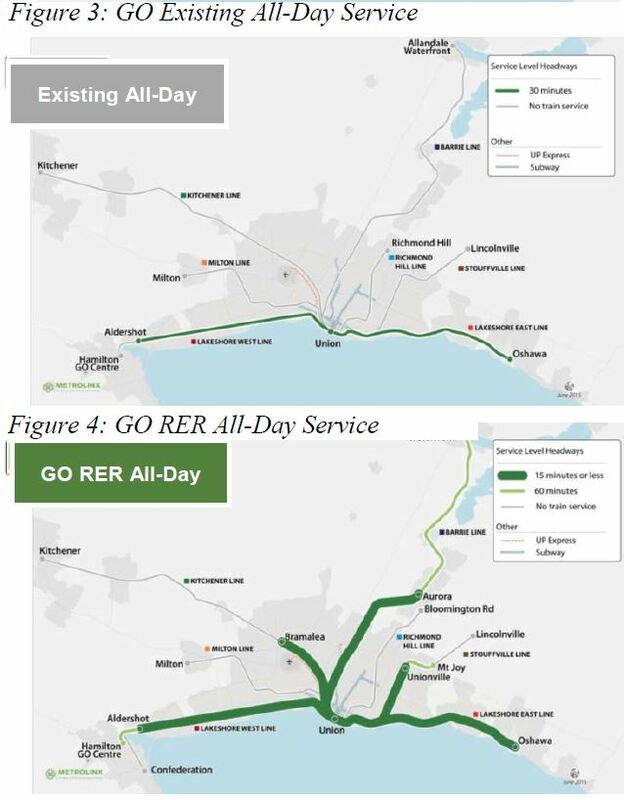 On the Kitchener corridor, the GO RER service concept calls for diesel and electrified GO service with express and local stops; VIA and UP Express trips add further pressure to corridor capacity. 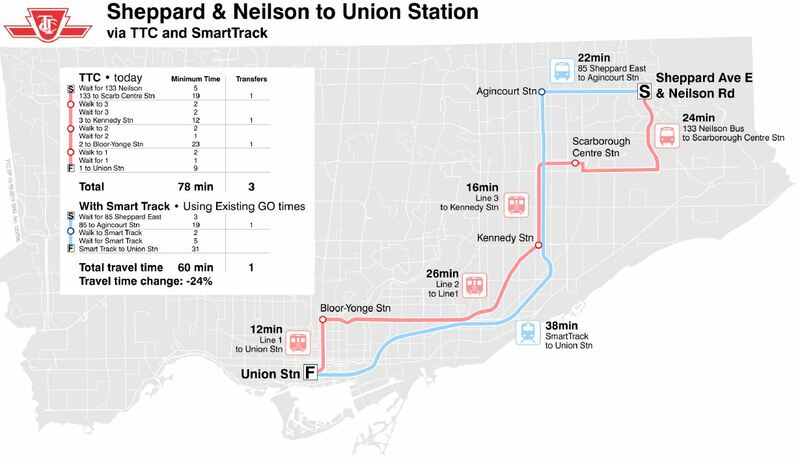 Running continuous service from Eglinton through to the Kitchener corridor, as proposed in the SmartTrack service concept, would put pressure on track capacity because it introduces a different type of service with a different speed and stopping pattern into an already complex environment. On the Stouffville corridor, the current GO RER service concept calls for seven trains in the peak hour, including three trains from Lincolnville and an additional four trains from Unionville. Choice: How well does the station connect to the transit network and serve a substantial potential market of riders? Experience: Are there key destinations nearby by which ST improves transit access? Social Equity: Is the station near Neighbourhood Improvement Areas and their affected population? Shaping the City: Is the station located in an area of existing and planned population growth? Healthy Neighbourhoods: Does the station integrate well with neighbourhoods by, for example, occupying currently vacant land? Public Health & Environment: Does the station conflict with natural or cultural features? Affordability: What is the station’s cost and the availability of a site? Supports Growth: Is the station located in an area of existing and planned employment growth? This framework is common to all of the planning studies now underway and is used deliberately to permit comparison between various evalations. At this point, the evaluation looks at stations from a planning perspective, not a technical one, although the latter will be important in areas where physically adding a station may present challenges for train operation and surrounding infrastructure. Some of this is mentioned in the Station Profiles. Metrolinx has its own new station evaluation underway as part of a network-wide review. That study began with a very long list of potential locations, and has only recently moved into the short-listing process. The Metrolinx analysis includes technical factors that are not in the City Planning list. 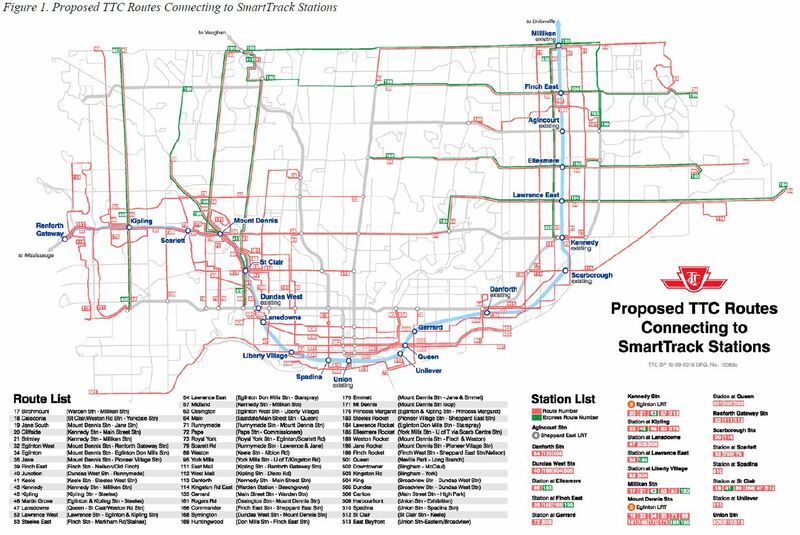 This list is intriguing because it begs the question of whether SmartTrack should have 26 stations at all, or if it can be an effective service with far fewer. A reduction in station count would have major effects on the integration of TTC service. For example, only the stations at Steeles (Milliken) and Eglinton (Kennedy) on the Scarborough leg rank highly, while Finch East, Agincourt (Sheppard) and Scarborough (Danforth) have a low rank. It is important to remember that even existing GO station locations are dictated by the rail corridors which tend to be in old industrial areas that are not necessarily well-related to city planning goals for growth or to existing residential or employment concentrations. Completely ignored in the discussion (and in the related TTC Integration paper) is the effect that Scarborough Subway stations would have on some of the proposed SmartTrack stations notably by intercepting passengers further east on a more frequent service and one that will more likely remain part of the TTC fare network. Equally important are political considerations. SmartTrack is, among other things, pitched as yet another way to give Scarborough better access to downtown. If stations were dropped from the plan, how would this be perceived? Will ST gain many stations on a “chicken in every pot” basis and be built more like a “traditional” subway line with stations even in locations that might not be able to support them? Stations that are close to the core are cited as potential locations where the streetcar network could be offloaded. However, this ignores the fact that physically transferring from a streetcar line to ST would involve getting off cars, possibly after they are well-loaded, accessing the ST station, and waiting for a train by which time the streetcar, for all its problems, would already be downtown. Having two lines cross on a map does not mean that this would be a convenient, well-used transfer point, especially for trips that are not bound for Union Station. This is a point where the station study must interface with demand modelling. How much will each station actually contribute to SmartTrack demand, and how would the network behave if selected stations were dropped from the plan. The Western Corridor is a very challenging part of the SmartTrack plan, and one for which it was severely criticized (by me among others) for the superficial and incompetent way in which it was reviewed as part of Tory’s campaign. The “consultants” behind this plan were unfamiliar with the area and the technical problems involved in a through route from the Weston corridor onto Eglinton Avenue, not to mention the basic challenge that the presumed right-of-way, the Richview Expressway corridor, had been sold off by Build Toronto. Surface operation along Eglinton, claimed as part of the original SmartTrack, is simply not feasible with the type of trains that will be used. The link from the Weston corridor to Eglinton will be complicated with both elevated and underground construction, and is likely to disrupt neighbourhoods through which it will pass. Additional track capacity will be required in the Weston corridor to accommodate all of the planned services, and this may conflict with some potential station locations. The “Corridor 1” family of options deal with various ways to link the Weston corridor to Eglinton West. Three of the four maintain a link to the Mount Dennis Crosstown station, while the simplest (and the one proposed in the election literature) does not. None of them is a simple connection both for their interaction with railway infrastructure and with neighbourhoods. The “Corridor 2” family of options take the SmartTrack route further northwest on the GO corridor and turn south into or beside the airport lands. These options have their own problems including potential conflicts with the airport itself, and suitability of station locations. Moreover, the link to the Mississauga Corporate Centre would be somewhat roundabout. A further problem with this group is that it would require capability for combined ST, RER and UPX operation to exist as far as the airport rather than only to Eglinton. “Corridor 3” was a proposal for a stand-alone line on Eglinton from Mount Dennis to the Corporate Centre. This makes no sense at all as it would be an orphan line at considerably greater expense than the surface LRT alternative. It did not survive the technical screening. Cost estimates for these options are not yet available. While detailed analysis related to the full length of the Kitchener corridor is beyond the scope of this feasibility review, the review provides some insights pointing to areas requiring further analysis. The technical analysis indicates that without significant signalling upgrades, improvements to train control systems, or modifications to GO RER, SmartTrack or Union Pearson Express service concepts, two additional parallel tracks “are highly likely” to be required in the Kitchener corridor between Union Station and Mount Dennis or Woodbine Racetrack to make the connection to the new SmartTrack heavy rail corridor from Mount Dennis to the MACC. Two new tracks for SmartTrack service would require a widening of the Kitchener corridor between Mount Dennis or Woodbine Racetrack and Union Station and associated property acquisition for all heavy rail options to the MACC. All of these services have different operating patterns that make management of operations on the corridor complex. This assumption of two additional tracks could possibly be adjusted if there were to be some form of integration of GO RER, SmartTrack and/or Union Pearson Express services and/or adjustments to service frequencies. Further analysis is required to test assumptions with respect to such integration. existing development adjacent to the Kitchener corridor may also limit corridor expansion in some sections. Note that the design target is a 15 minute headway, not “better than 15” as cited elsewhere in the reports. Moreover, the issues raised here were known a year ago, and should have been clear to SmartTrack proponents, but they were “experts” who chose to ignore the critics. Sorting all of this out is not a job for a few months’ work between now and early 2016 unless a lot of options fall off of the table fairly quickly. What remains is unlikely to please those for whom the project was little more than a line drawn on an out-of-date Google Earth map. The TTC has reviewed its surface network to determine how it might act as a feeder/distributor for SmartTrack. The analysis assumes that all of the currently proposed ST stations are implemented. Notable on this map is that in Scarborough, the dense knot of routes feeding into the SRT at Scarborough Town Centre has mostly disappeared, but this is replaced by a comparable arrangement at Mount Dennis. Obviously this design only works if SmartTrack really is a TTC fare line just like the subways because much of the incentive to switch to it will depend on cost. A related problem will be service frequency and the availability of competing routes to downtown (the Scarborough Subway to the east, and the Eglinton Crosstown + Spadina Subway to the west). The TTC describes a process for evaluation of service changes that considers the degree to which passengers overall will be “convenienced” by any change that might be implemented. This evaluation is not included in the report on a route-by-route basis. This process will feed into both the demand modelling and the station analysis. This is particularly important where “off-route diversion” is required for a bus to reach a SmartTrack station. If few riders would make use of such a connection, the diversion simply adds travel time and annoyance for most riders who are making through trips. Some residents asked questions on the distinctions and similarities between RER and SmartTrack. There was positive feedback for SmartTrack related to TTC fare integration, additional stations, electrification and greater frequency of service. Other comments were concerned that SmartTrack was redundant with RER, and that it would add further pressure to existing crowding at Union Station. A few comments were concerned with the potential impacts of SmartTrack stations on local communities and surrounding land uses. There were also concerns related to the coordination and prioritization of Toronto’s transit projects. There was concern expressed by some that SmartTrack has priority status over the other projects concurrently under way (including Scarborough Subway Extension and Relief Line project assessments). Some comments indicated that land-use compatibility was a concern, particularly for communities and areas that would be impacted. Some comments related to the service concept, looking to gain a better understanding of how SmartTrack would impact other transportation services. Other comments related to technical analysis and asked if building heavy rail along the Eglinton corridor is feasible from engineering and operational standpoints. A majority of people preferred the Base Reference Case LRT, indicating support for the proposed LRT station stops and LRT technology as most appropriate for the Eglinton corridor. Other comments on the Base Reference Case LRT proposed improvements to the LRT including grade separations and removing some station stops to increase speed and travel times. No consultation has occurred yet for the portion of SmartTrack outside of Toronto. This will be coordinated with the affected municipalities. What is striking about this feedback is that people like the idea of SmartTrack, but have reservations about how it fits into a larger picture and its effect on local neighbourhoods. Before diving into the specifics of SmartTrack, this report repeats a point often made and just as often ignored in transit debates: transit exists to support travel. It is worth noting here that the 504 King Streetcar is capacity constrained by the size of the streetcar fleet and the level of service provided in that corridor. Also, the high capacities shown for GO/RER and SmartTrack, overlapping with subway demand, depend on a much higher level of service than is currently operated or is planned for these routes. For example, if either of these runs with 2,000 passenger GO trains every 15 minutes, then the capacity is limited to 8,000/hour, very, very much less than the subway lines. City Planning undertook a study of rapid transit priorities that identified the top-ranked projects based on three principles: serving people, strengthening places and supporting prosperity. (A much more fine-grained set of criteria was also applied.) At the time, SmartTrack and RER were not in the mix, and Planning is revisiting the process. The outcome will be interesting because of a political context in which a low ranking for either of these schemes will not fit well with the accepted political wisdom. For reference, the original set of top-ranked projects is still available on City Planning’s website. Note that these projects do not align well with SmartTrack, or putting it another way, SmartTrack does not align well with lines that had been flagged as the most important. To what extent the new map will reflect actual transit rider needs versus a gerrymandered political scheme remains to be seen. 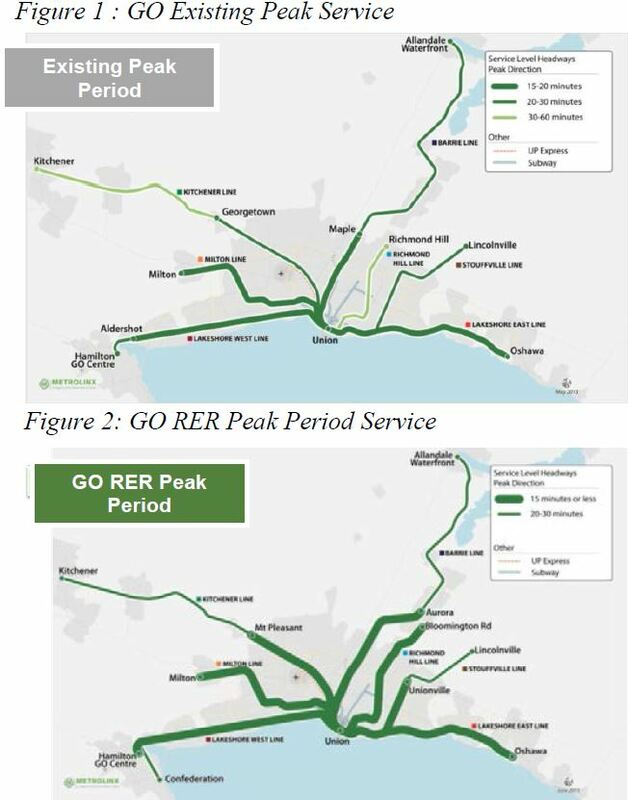 SmartTrack and GO RER would both make better use of the currently under-utilized GO Rail corridors in the off-peak periods, a development which is called for in the Official Plan and is supported by Provincial Policy Statement Policy 1.6.3. SmartTrack proposes further enhancing GO RER services to provide more local rapid transit within Toronto. With the current network configuration, the single biggest constraint to meeting the demands on the City’s rapid transit network is the capacity of the Yonge Subway, particularly the transfer at Bloor Station. SmartTrack is being designed to relieve this congestion, and would expand rapid transit to new parts of the City. Depending upon the final station locations selected, the line has the potential to serve key development nodes like the Unilever site and Liberty Village. It would also serve the fast growing Distillery District and West Don Lands areas as well as several other large underdeveloped sites and many Employment Areas, improving their development potential. Some of the area through which this line would pass has recently experienced very rapid growth. Road-based transit services in the area face congested conditions and crowded vehicles. Although the report talks about subway relief, it is important to note the statement that SmartTrack “is being designed to relieve this congestion” is not the same as “it will provide relief”. After all, the demand modelling has not yet been done, and we know from the June 2015 Metrolinx update that the actual effect of ST on subway congestion is minuscule compared with what a Don Mills Relife Line to Sheppard would provide. The degree to which ST can actually achieve the potential implied above depends a great deal on station siting, access, service levels and fares. Approximately 12 Neighbourhood Improvement Areas (NIAs) are within walking distance of SmartTrack stations, depending upon final station locations. SmartTrack does not pass through significant areas of population not already served by high frequency and high capacity rapid transit. These bullets make the important point that SmartTrack would serve new areas that do not now have good rapid transit service. However, this comes back to issues such as which stations would actually be built, along with the service pattern and fare structure. SmartTrack does not serve many areas planned for residential growth which are not already served by rapid transit. The percentage of land served by SmartTrack that is planned for residential growth is slightly above the average of the projects evaluated. The projected population growth around some SmartTrack stations in the City of Toronto is limited. Many of the areas that have projected population growth are already served by rapid transit. Just because there is transit service somewhere today does not mean that the area is “served” by it especially if there are capacity and other service quality problems. A station with little growth potential immediately nearby might still serve a higher population via surface feeder routes. The relative locations are often constrained by existing rail corridor locations and land uses. Neighbourhood impacts are low except in the Eglinton Corridor. This is easy to understand given that SmartTrack spends its time in largely industrial rail corridors. Eglinton is quite another matter. The stations in the City of Toronto proposed in the SmartTrack concept serve significant areas of employment growth. The percentage of land served by SmartTrack which is planned for employment growth is moderately above the average of the other 25 projects evaluated. The Woodbine (Northern Extension) corridor for the western alignment performs better than the Eglinton Ave corridor as the former has a largely residential catchment. Despite SmartTrack serving large areas of land targeted for employment growth, the projected employment density in the vicinity of proposed SmartTrack stations is low. Under some employment projection scenarios, there are stations which serve areas of significant planned employment growth and density (e.g. Unilever). Some of the other areas of high projected employment growth are already served by rapid transit. The existing employment density around SmartTrack stations in the City of Toronto is low. 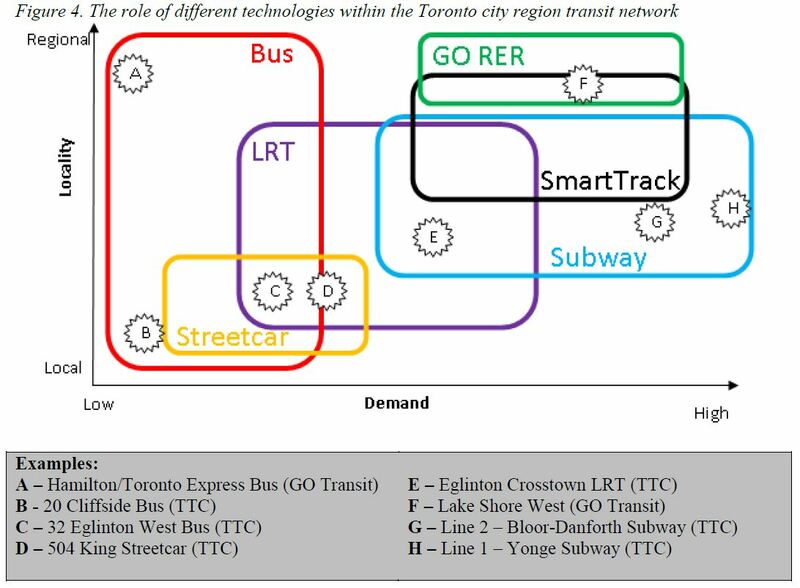 Many of the areas of higher density which will be served by SmartTrack are already served by rapid transit services (e.g. Union). An important issue that is missing in these observations (both for residential and employment densities) is a sense of scale. How much growth are we talking about in each case, and to what extent will SmartTrack provide useful access as part of the transit network? How likely is growth in the designated areas particularly considering how long some of them have been underused? The Relief Line: This is still focused on the narrow Danforth to Downtown segment which reflects the TTC’s long-standing bias against the RL in general and anything beyond a connection to Danforth in particular. The Scarborough Subway whose co-existence with SmartTrack remains a question for the demand model. Brief descriptions of the LRT projects in various stages: Waterfront, Eglinton, Finch and Sheppard. The projection of population and employment is an essential pre-requisite to the Demand Modelling. For this purpose, the zonal system used in past projections had to be updated to be more finely-grained reflecting the spacing of SmartTrack and other rapid transit stations within the study area. Population growth was modelled both for the basic data from past studies and the 2011 census, as well as on an enhanced basis presuming the existence of SmartTrack. This latter scheme is dubious because it presumes ST is sufficiently important that it would change regional growth at a measurable level as distinct from other city and transit network changes that might occur. Once again, the effect of ST will vary substantially with the service level actually operated. At four trains/hour, this is little more than an improved GO service, not a new equivalent-to-subway line. Moreover, the RER and other rapid transit projects will also contribute to growth. This smells of an attempt to goose projections on the ground that SmartTrack is uniquely able to stimulate growth beyond what might otherwise occur and even considering that it does not serve most of the GTA. Even if we accept the premise, the delta for the SmartTrack versions out to 2041 is only about 6% which is small enough that it could well be within the margin of error for such predictions. 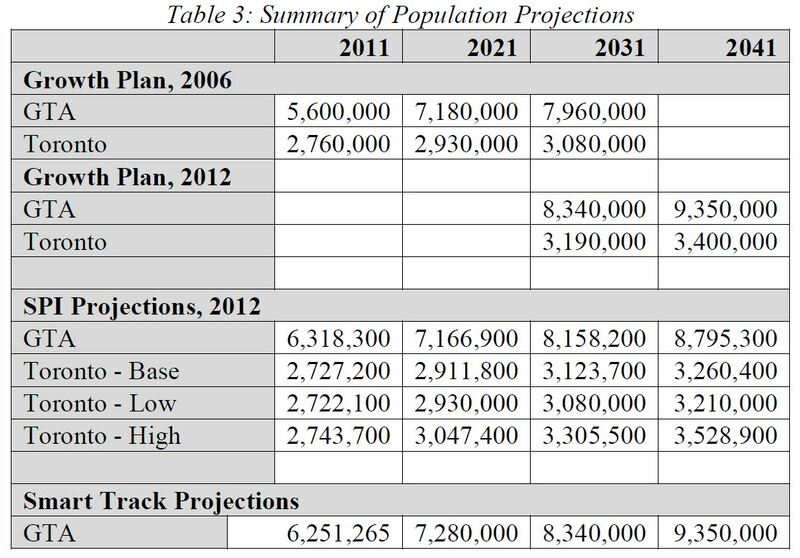 For the employment model, there is a similar table, but the difference between the basic projections and the SmartTrack versions is even smaller than for population growth, only 2-3% generally. The report continues with its meandering examination, but it contains an important point: office space projections are provided by a sub-consultant, SRRA, who were responsible for the SmartTrack scheme in the first place. Of particular importance, this is the same consultant who in another study claimed that office growth downtown (and in many older areas of the city) was dead, and that all the new growth would come in the suburbs in areas (surprise!) that SmartTrack would serve. This begs the question of whether the figures actually reflects trends that have been evident with a shift in both population and employment to more urban areas. There is supposed to be a separate report on future office development from SRRA at a later date. This really is a report for the serious planning nerds, and yet the work it represents will have a considerable effect on the outcome of demand modelling. The figures presented here are aggregated to the City of Toronto and “Rest of GTA” level, and we have no idea of the distribution within each of these areas. This section describes in great detail the capabilities of trip modelling in the University of Toronto’s new “GTAModel V4” which the City of Toronto will use for its planning. This is a much more sophisticated model than the one used in previous transit studies because it handles trips at a much more finely grained basis and deals with all-day flows through the network including counter-peak movements. It also models the effect of network congestion, capacity limits and fare levels on the route choice made for the modeled travel. The model is in the final stages of calibration, essentially determining that for recent known traffic data it will produce the observed behaviour from known population, employment and other demands placed on the network. 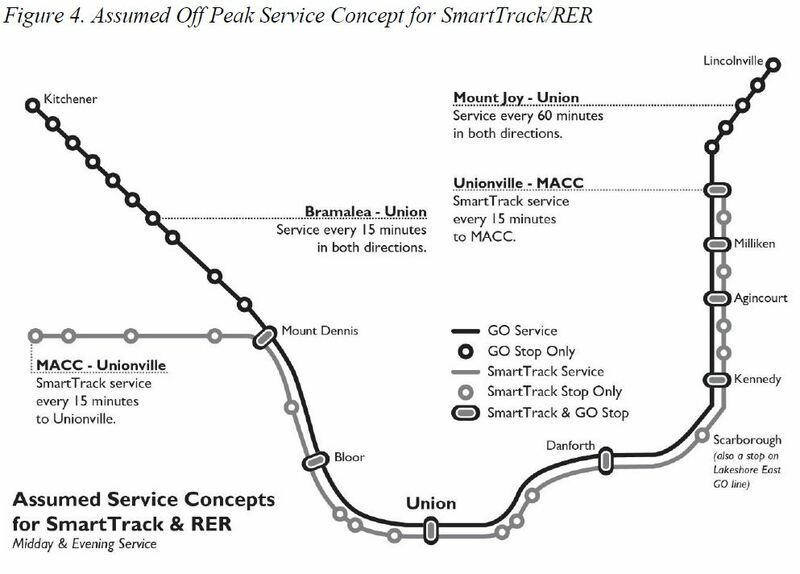 As mentioned above, the service design that will be modeled is based on a 15-minute headway of SmartTrack trains overlain on GO’s planned service level for RER in the same corridors. Three connections from Mount Dennis to the airport will be modeled: the Eglinton SmartTrack route, the North Etobicoke SmartTrack route, and the LRT extension as the base case. Also to be examined are the effects of stations, fares and service levels. This work is expected to report out in first quarter 2016. Finally, we come to the money. This report starts off with a little tutorial to distinguish between “funding” and “financing”, terms that are frequently confused, especially by politicians. Financing refers to the financial mechanisms or tools used to raise the initial funds to pay for the construction of the project. Financing is usually required when there are differences in timing between project expenditure cash flows (often required upfront) and project revenues, which may not occur until much later. Debt, bonds, equity, and capital lease arrangements are typical financing tools to raise the initial funds for the project, but there are many other tools and structures that can be used depending on circumstances and level of participation and risk allocation between the public and private sector. The use of financing creates a future obligation to repay the money back with a return on capital investment. Funding refers to the sources of project revenue, including future revenue streams that the project owner will use or pledge to repay the financing of the project over time. In brief, “financing” is the mortgage you take out to buy a condo, and “funding” is the money you will earn to pay it off. For transit projects, very large amounts are involved, and on the “funding” side of things, there is much competition for scarce resources. This is further complicated in the “financing” side of things because too much borrowing pushes up future costs, just like maxing out your credit cards and having no money left for food. It’s a balancing act between many factors and competing priorities for public investment. On the funding side, Queen’s Park is looking for $5.2-billion from Toronto and Ottawa based on the premise of a roughly $8-billion SmartTrack budget with the province putting in one third via “in kind” spending on its GO network. The Feds committed to $2.6b from their new Public Transit Fund, although the exact status of that is up in the air pending the election on October 19. The Liberals, likely inheritors of the government, have also pledged to support SmartTrack. The problem with this, of course, is that the support is more for political reasons (supporting Mayor Tory, and the “me too” phenomenon we saw with Scarborough Subway Champions), than for planning ones given that much work remains to be done on costing and on establishing the exact role and worth of the SmartTrack project. The NDP, for what it’s worth, instead pledged funding without attaching it to a specific project. In any event, while it is nice to have promises of support, this comes from a barrel that is not bottomless, and we have yet to debate whether the first $8-billion collectively to be spent by three governments should regard SmartTrack as the top priority in Toronto. The City, for its part, is about to launch into its annual Capital Budget review which includes the discussion of debt levels and potential alternate revenue sources. Recent remarks by City Manager Peter Wallace suggest that he is open both to changes in the City’s self-imposed debt ceiling as well as other sources of revenue, but these each bring problems. A higher ceiling allows more debt service charges (and hence more debt) relative to tax income, but according to Wallace, even that won’t deliver the kind of money needed to finance the many big projects facing the City, and more debt has implications for future budgets. New revenue streams inevitably spark political opposition from Councillors who could not agree on using any of the revenue tools actually available to them, let alone asking for something new like a sales tax. The report talks of three potential funding sources: Tax Increment Financing (TIF), development charges, and sale of development rights. The first and obvious question is “where will development occur”. This brings us back to SRRA who, as mentioned above, had previously held that much development would lie outside of Toronto. They have been commissioned to produce projections of what might occur. Strategic Regional Research Alliance (SRRA) has been commissioned to prepare population and employment forecasts under scenarios that include and exclude SmartTrack. SRRA has expertise of the local real estate market. Using their population and employment forecasts, they will identify specific areas within the City where increased development is projected to occur. SRRA’s forecasts will also consider scenarios under current planning constraints and relaxed planning constraints. There are two big problems with this. First, development outside of Toronto in Mississauga or Markham is beyond Toronto’s taxing authority. If any value is to be captured from it, regardless of the mechanism, it will benefit municipalities who are not contributing to funding of the SmartTrack project. Second, the development market in the core area is very strong, and much will occur whether SmartTrack is in place or not and its incremental effect could be small (see also Population and Employment projections above). The premise behind TIF is that investment in an area will produce development that would not have occurred otherwise. The efforts of Waterfront Toronto are a perfect example in that much land would still be post-industrial wasteland but for the infrastructure installed to support a new, very large population. 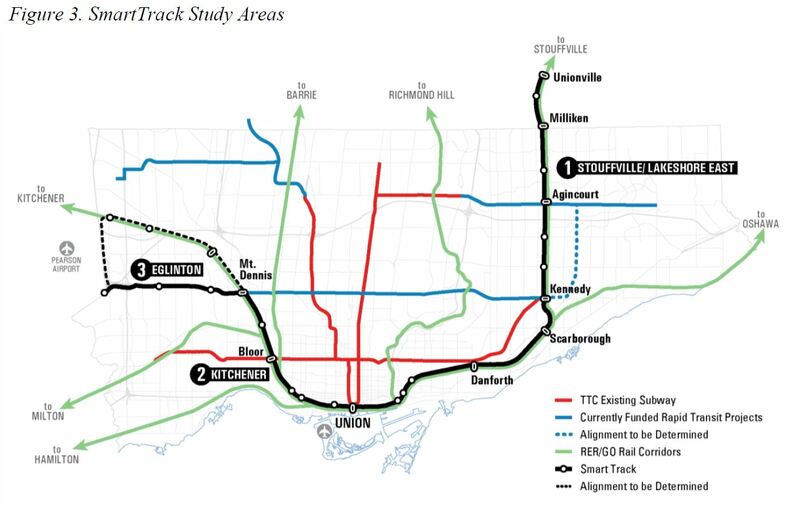 SmartTrack does not fall into the same category except for specific areas such as the Great Gulf (Unilever) site that require substantial new transit investment. It is not clear how much development will actually be due to ST and how long Toronto would have to wait for this to occur and TIF revenues to pay off the debt. This chart is “magical” in that it makes the incremental TIF revenue look like a pile of new money. However, much depends on what lies in the “TIF Zone” and how much growth within it can be tied to a project. For example, one could not make all of the core area a TIF zone because, self-evidently, it is doing very well without SmartTrack. If the zone gets smaller, and the tax revenues (base and incremental) are reduced correspondingly, then there is not as much actually available as the chart might suggest. Moreover, the further off actual development lies, the greater the risk that it might not ever occur, or even worse, that accommodating pols will “relieve” future, hard-pressed developers of this burden. Another source of revenue is “tax uplift”. For example, if the value of your house goes up by 10% because there is a new transit line (even better a new station) nearby, then that increase is available in theory as a transit funding source. The problem is that many factors affect property values, and house prices are rising strongly in Toronto even without transit spending. This also begs the question of whether, for example, residents of Brimley Road would be hit with new taxes on the presumed uplift in property values thanks to their new subway. The determination of tax increment from new development is relatively straightforward and does not require any special legislation or tools. 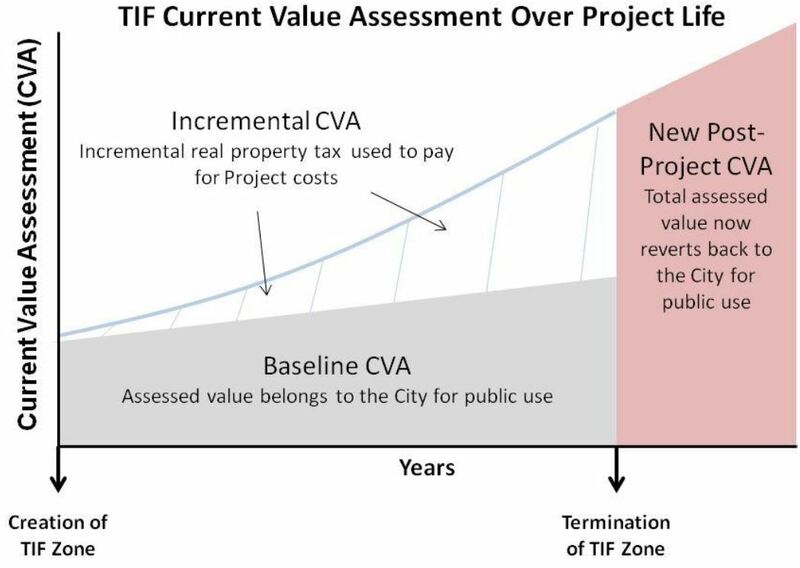 Once a TIF zone has been determined, new development taking place in that zone will be physically observable, and the new taxes generated directly measurable from its current value assessment. The operative word here is “subjective”. The further one looks into the future, the less one can attribute a development to a specific past transit project unless there is a very close linkage between that project (a station location, for example) and the development. Moreover, any new development brings costs other than transit service that must be paid for from tax revenues, and the base level may not be adequate for this purpose. With respect to residential values, the City did observe an increase of 3-5% in the Sheppard East corridor relative to city-wide values, but this is not solely attributable to the subway line. Development Charges operate under a provincially-mandated formula that looks at all of the capital projects intended to support growth of the city, and the degree to which these specifically serve new development as opposed to providing improved service for the existing population and businesses. For example, a new subway line may carry many riders, but it represents better service for a large number of them and only the net new ridership can be claimed as “development related”. This trims a great deal of the city’s capital costs out of the pool on which DCs are based because they are not growth-related. Once again, the question is whether SmartTrack will provide mainly much improved service for an existing demand and population, or if it can be linked specifically to new growth and to what degree. Services that are improved for the existing population must be funded through general taxes and DCs are only available for growth-related changes. Development rights on city land come up from time to time as another magical source of revenue, but the many of the city-owned lands along the SmartTrack corridor are either unsuitable for sale as development parcels, are the site of functions that would have to be relocated, possibly with difficulty given that their current location is industrial, or are lands that have already been handed over to Build Toronto for sale (the Eglinton West properties are a prime example). Unlike the oft-cited Hong Kong, the City of Toronto does not own all land and is not in a position to profit from sale or long-term lease as a transit funding mechanism. Yes, there are potential locations where the city and local landowners could co-operate on intensification, but the available revenues would not come close to paying for a multi-billion dollar project. At this point, the City staff are reviewing their options and will get back to Council in the new year. By then, the actual cost and scope of SmartTrack may be better understood, along with actual funding commitments from Ottawa. If you have read this far, many thanks. Digesting all of these reports takes time, and yet this is one of Toronto’s most important issues probably in this decade. We wring our hands about the backlog of transit spending, but given a chance we focus on one project that was born of an election tactic and now has the force of a signature Mayoral project. There is much more to transit in Toronto and the GTHA than SmartTrack, but we must understand what SmartTrack really is to properly set it in place among competing demands of which transit is only one. This entry was posted in A Grand Plan, Downtown Relief Line, GO Transit, SmartTrack, Transit, Union Station, Waterfront, Yonge Subway Extension. Bookmark the permalink. My main point is buff strength. Some people think if we just get rid of freight trains we can lower buff strength. But in light of fast VIA trains , potentially fast heavy GO trains and frequent service and level crossings we would need to keep the buff strength. But check out the Kingston and Oakville subs where trains can get very frequent and very fast VIA trains in the mix, and keep in mind not all trains run on time always, so trains show up at wrong times … and moving along pretty good sometimes. Get a CNR time card – it shows the permissible speeds. I am not arguing that BUFF strength requirements are going to vanish any time soon. I know what the maximum permissible speeds are but that doesn’t mean that all the trains are going to run at those speeds. The signal system maintains a large separation distance between trains and if a train is late and the line is busy it is not going to move at 90 mph changing tracks to go around slower local trains. Compared to past times there are only one or two VIA trains travelling in the peak direction in the rush hour. The VIA trains get 24 to 26 minutes to get from Oakville to Toronto, a distance of 21.4 miles so they are not going 90 mph for much of the trip if at all. GO owns the rights of way and controls the operation of the line. With RER there will be trains going near 90 mph but hopefully by then we will have a signal system that can handle more than 7 trains per hour per track and can actually control the trains instead of just the signals and switches. If this had been in place the VIA train would not have taken that 15 mph switch near Aldershot at 57 mph. The crew was assuming that the train would take the high speed switch (well 45 mph) farther down the line but forgot or didn’t know that it was out of service for maintenance and that they would be using the closer switch. If they had read the signal correctly they should have realized this. European railways which operate faster trains more frequently than in North America and use crash energy management and absorption systems to achieve similar or better results with lighter weight vehicles. This is what should be used in North America too.